M T D D e c e m b e r 2 0 1 8 42 2 0 1 8 S E M A S h o w sidewall and six-ply tread. Improvements over the prior model of the tire include side biters that are 50% larger and one ply that is 150% stronger, according to Robert Dejarnette, marketing program manager. "Our size offerings are 17-inch up to 24-inch wheel diameters. Height-wise the sizes go up to 40 inches," he said. Features include mud scoops and stone kickers. 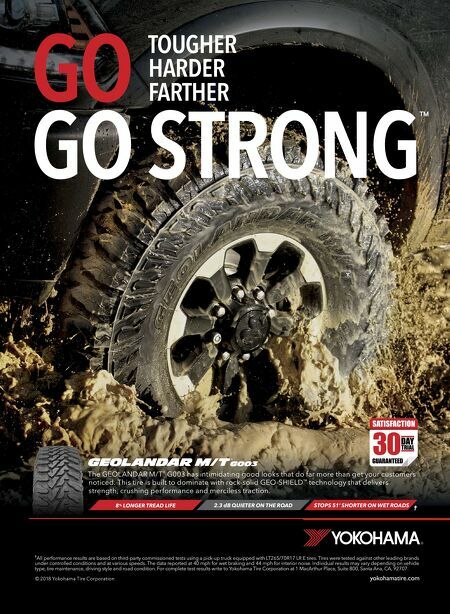 "It is a premium mud terrain tire." e Baja Boss will be available in 18 high load-carrying capacity sizes from 17 to 24 inches for a variety of light truck and SUV models — with 18 additional sizes coming later. e load ranges are developed for today's popular and extreme leveled/lied applications. e Baja Boss was one of thousands of products in more than 2,400 exhibit booths in the Las Vegas Convention Center. Here are more of the products and news from the show floor. 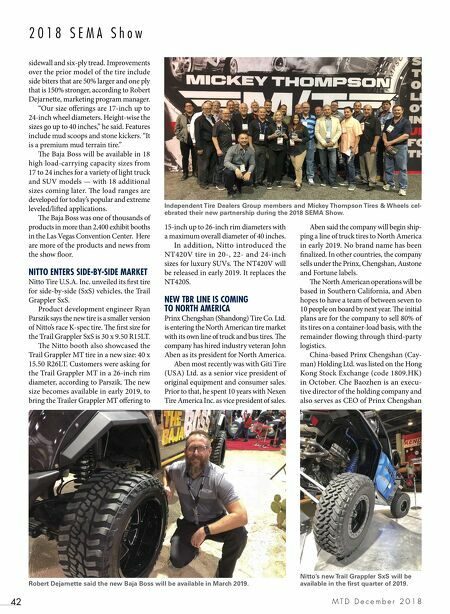 NITTO ENTERS SIDE-BY-SIDE MARKET Nitto Tire U.S.A. Inc. unveiled its first tire for side-by-side (SxS) vehicles, the Trail Grappler SxS. Product development engineer Ryan Parszik says the new tire is a smaller version of Nitto's race K-spec tire. e first size for the Trail Grappler SxS is 30 x 9.50 R15LT. e Nitto booth also showcased the Trail Grappler MT tire in a new size: 40 x 15.50 R26LT. Customers were asking for the Trail Grappler MT in a 26-inch rim diameter, according to Parszik. e new size becomes available in early 2019, to bring the Trailer Grappler MT offering to 15-inch up to 26-inch rim diameters with a maximum overall diameter of 40 inches. In addition, Nitto introduced the NT420V tire in 20-, 22- and 24-inch sizes for luxury SUVs. e NT420V will be released in early 2019. It replaces the NT420S. NEW TBR LINE IS COMING TO NORTH AMERICA Prinx Chengshan (Shandong) Tire Co. Ltd. is entering the North American tire market with its own line of truck and bus tires. e company has hired industry veteran John Aben as its president for North America. Aben most recently was with Giti Tire (USA) Ltd. as a senior vice president of original equipment and consumer sales. Prior to that, he spent 10 years with Nexen Tire America Inc. as vice president of sales. Aben said the company will begin ship- ping a line of truck tires to North America in early 2019. No brand name has been finalized. In other countries, the company sells under the Prinx, Chengshan, Austone and Fortune labels. e North American operations will be based in Southern California, and Aben hopes to have a team of between seven to 10 people on board by next year. e initial plans are for the company to sell 80% of its tires on a container-load basis, with the remainder flowing through third-party logistics. China-based Prinx Chengshan (Cay- man) Holding Ltd. was listed on the Hong Kong Stock Exchange (code 1809.HK) in October. Che Baozhen is an execu- tive director of the holding company and also serves as CEO of Prinx Chengshan Independent Tire Dealers Group members and Mickey Thompson Tires & Wheels cel- ebrated their new partnership during the 2018 SEMA Show. Robert Dejarnette said the new Baja Boss will be available in March 2019. Nitto's new Trail Grappler SxS will be available in the first quarter of 2019.